When hiring a company that specializes in online medical transcription, security should be your top priority. In 1996, the Health Insurance Portability and Accountability Act, also known as HIPAA, was created to protect patient medical records and other personal health information. HIPAA requires organizations to shield patient data against unauthorized disclosure and access by implementing a variety of security measures that prevent network and physical based intrusions. At Fast Chart, we pride ourselves in providing HIPAA compliant online medical transcription services to our clients. If your medical organization makes the smart decision to implement our service, you will enjoy the peace of mind that comes with knowing your patient records are safe and secure at all times. In order to keep your data safe, Fast Chart has hired a team of security experts who are highly knowledgeable and trained in cyber security. Our team works around the clock to apply safety measures that guarantee all patient records are kept confidential and protected against data transfer leaks. Each member of our security team has undergone a comprehensive background check and screening process. Fast Chart employees have also been required to sign a confidentiality agreement which informs them that legal action will be taken if HIPAA regulations are breached. To keep your data safe, Fast Chart has implemented a number of different safety measures. We only hire medical transcriptionists in the United States that meet our rigorous standards and training program. Allcomputers used by our employees are password protected and every file is backed up each month. Our employees are banned from bringing written documents or electronic devices with them while providing online medical transcription services. Additionally, USB ports and external drives are disabled to prevent the unauthorized copying of documents. Security software, antivirus software, and firewalls are all updated regularly. To ensure that all systems meet certain security regulations, technical evaluations are conducted on a periodic basis. Our safety standards also safeguard from the illegal deletion, revelation, and alteration of patient related health information. Lastly, each and every Fast Chart employee is well-trained to maintain security, privacy, and confidentiality. Fast Chart is dedicated to keeping your patient data secure. 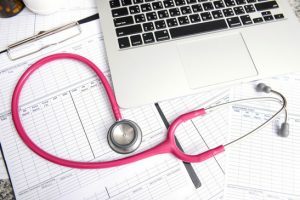 As a HIPAA compliant medical transcription provider, we provide our clients with a diverse array of clinical documentation and editing services in the safest manner possible. For more information on how Fast Chart’s online medical transcription can save you time and money, contact us today.